Posts, Telecommunications and Information Technology Minister Mustafa Jabbar has said the government is implementing a project for “digital security” which would also secure the social networking platforms. “Department of Telecom is entrusted to implement the project, and it would make us fully capable to do ‘content filtering’ or look into the aspects what would be required,” revealed the minister. 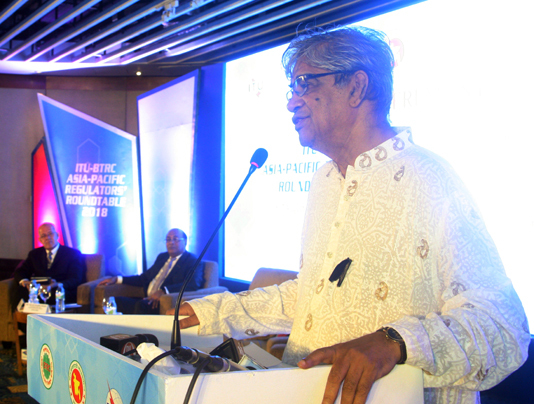 The minister was addressing the opening ceremony of a two-day conference titled “ITU-BTRC Asia-Pacific Regulators’ Roundtable-2018” as the chief guest at a city hotel on Monday. Jabbar said they can only request facebook to drop any content and “can’t ensure the total security depending on facebook”. Posts and Telecommunications Division Secretary Shaym Sundar Shikder, BTRC acting Chairman Md. Jahurul Haque, ITU regional director on Asia and Pacific Ioani Koroivuki and Asia-Pacific Telecommunity (APT) Secretary General Areewan Haorangsi also spoke in the opening ceremony. Posts and Telecommunications Division and Bangladesh Telecommunication Regulatory Commission (BTRC) are jointly organizing the “ITU-BTRC Asia-Pacific Regulators’ Roundtable-2018”. The roundtable will be followed by a three-day conference “18th APT Policy and Regulatory Forum (PRF-18)” beginning Aug 8. A total of 130 representatives including head of regulatory body of different countries, telecom operators and experts are expected to take part in these events. The theme of the roundtable is “New Regulatory Frontiers to Support Digital Economy”. It will focus on eco-system for digital economy, barriers of digital connectivity and way out, challenges of new technology and doing for regulators, broadband connectivity for all and legal and regulatory frame works for safety of data user etc. The PRF-18 will concentrate on policy and regulatory affairs regarding telecommunication and ICT.